Have you ever wondered what the different charges on your gas bill mean? This video will break it all down for you. We want to make it easy for you to locate information on your bill, review meter readings, consider payment options, and learn how to save money on energy. From gas rates to your rights as a customer, we’ll walk you through it all. Whether you receive a paperless bill through e-Account or a traditional paper bill in the mail, here you can learn more about the information available on your Peoples bill. A form you can use to report a mailing address change or make a monthly pledge to the Dollar Energy Fund. Helpful definitions of terms on your bill. Description of charges on your bill. 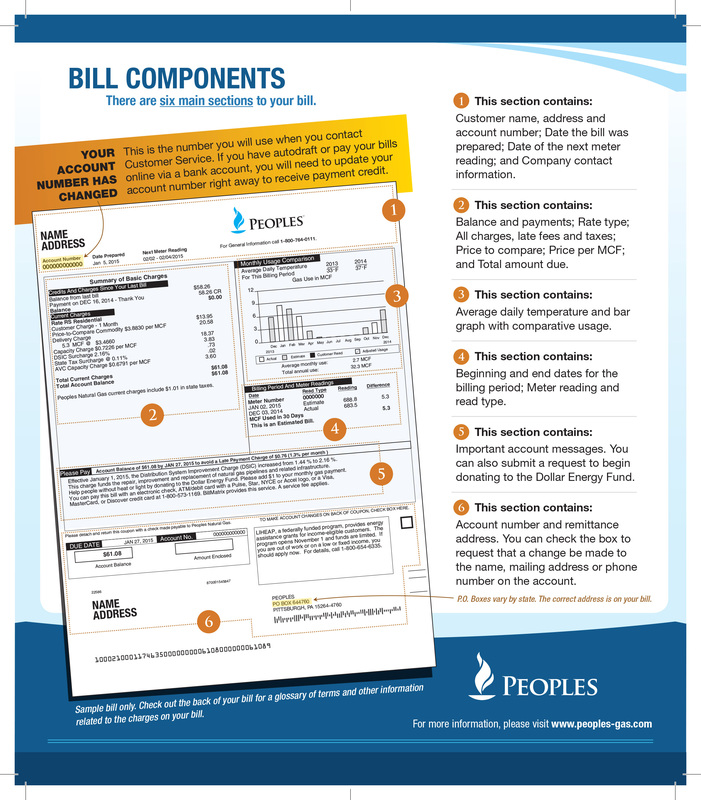 ﻿If you receive a bill from Peoples in the mail, you've probably also seen a copy of Peoples View—our customer newsletter—tucked into your bill alongside other messages about rates, customer assistance programs, and other important notifications. These bill inserts are an opportunity for us to talk to you, our customers, and share valuable info. Below you'll find copies of Peoples View and the other bill inserts that we've sent out over the past year. Keep in mind that there are sometimes different versions, depending where you live. If you have any questions about these bill inserts, please feel free to give us a call at 1-800-764-0111 to speak with a customer service representative. Our Peoples View customer newsletters and our bill inserts are an opportunity for us to talk to share valuable information with our customers.